The Benson class was a class of 30 destroyers of the U.S. Navy built 1939–1943. The first ship of the class was the USS Benson. The U.S. Navy customarily names a class of ships after the first ship of the class; hence the Benson class. It was named after William Shepherd Benson, a graduate of the Naval Academy in 1877. He commanded the USS Albany, USS Missouri, USS Utah, and the Philadelphia Navy Yard. Benson was appointed first Chief of Naval Operations in 1915 and then served as CNO until he retired 25 September 1919. He died in Washington, D.C., 20 May 1932. The Benson class was designed as an improved version of the Sims class with two stacks and a new machinery arrangement that featured alternating boiler and engine rooms designed to give the ships a better chance at surviving torpedo damage. Their scantlings, or framing dimensions, were increased to carry the weight of the new machinery. This increased the ship's displacement by about sixty tons. The Benson-class destroyer was the backbone of the pre-war Neutrality Patrols and brought the action to the enemy by participating in every major campaign of the war. Commissioned on July 25 1940, the USS Benson was in time to see extended combat during WWII. The USS Benson (DD-421), the only ship of this name in the U.S. Navy thus far, was the lead ship in a class of destroyers. Before the USA entered the war, the vessel was escorting convoys to and from Iceland. Subsequent to the events of Pearl Harbor, it was again escorting convoys, this time to the UK. An at-sea collision prevented its participation in the landings in North Africa, although it did support the later invasion of Sicily and the landings at Salerno. In 1944 it was fully engaged in convoy duties in the Mediterranean, and succeeded in shooting down several German aircraft. It also supported the invasion of southern France. The final weeks of WWII were spent in the Pacific. Its valorous WWII service earned the ship four battle stars. She was decommissioned there on 18 March 1946, placed in reserve, and assigned to the Charleston Group of the Atlantic Reserve Fleet. On 26 February 1954, Benson was transferred to the government of the Republic of China, and she served the Republic of China Navy as Lo Yang (DD-14) into the mid-1970s. As the result of a survey made of her early in 1974, the Taiwanese replaced her with another American destroyer that the Navy loaned them in 1975, the former USS Taussig (DD-746), which then became Lo Yang (DD-14). Meanwhile, Benson’s name was struck from the Naval Vessel Register on 1 November 1974; and she was sold to Taiwan, presumably for cannibalization and scrapping. Dragon adds another ship to its growing catalogue of US destroyers with the inclusion of the USS Benson to the mix. Now you can do an early Benson class with the USS Laffey and a late war one with the USS Benson. The kit is superbly molded as are all of Dragon's Destroyer kits. It includes a raft of features that are listed below. The kit includes a goodly number of photo etch parts, but not a set of railings so you'll need to get those from some other source. Some of the p.e. parts are optional such as the hatch faces. Instructions are well done with the usual Gunze and Model Master paint references. Dragon neglected to include the main deck non-skid decal placement so an entire addendum sheet is dedicated just to placement of these items. 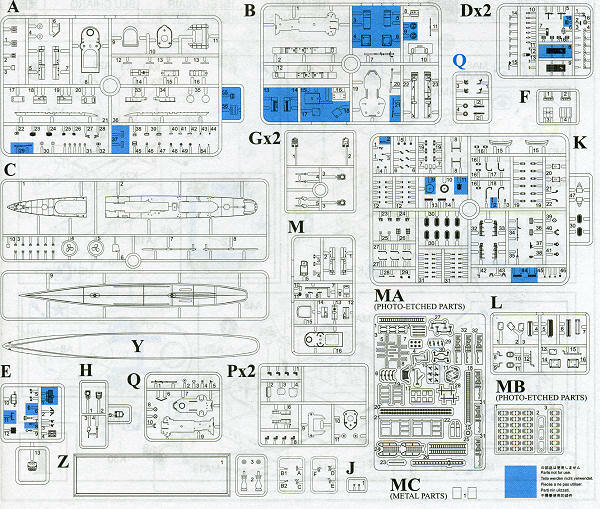 If you like 1/350 ship kits in general and destroyers in particular, then this is a kit for you. It is reasonably priced and offers a level of detail that you will like.